The current generation of consoles has opened the door for re-releases of past game hits, as well as low-cost updates and sequels. Already, several publishers have taken steps to bring their back catalogs kicking and screaming into the modern era, and there has been a string of quality retro goodness pouring onto all three systems. 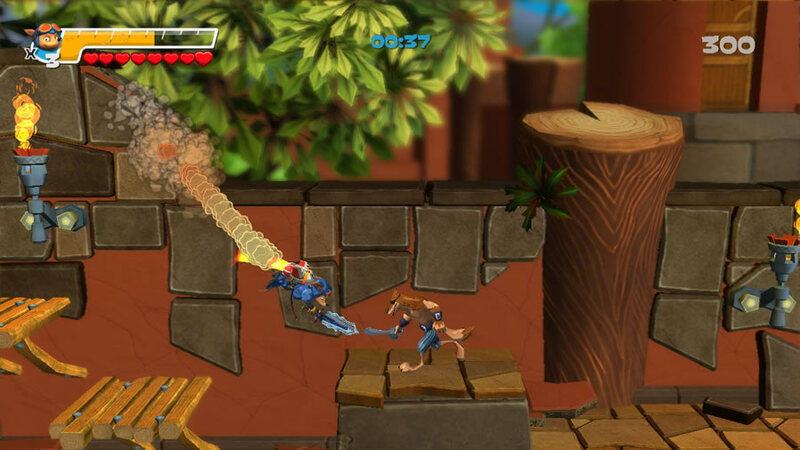 Capcom has brought sequels to Mercs and the original Mega Man games, Sunsoft recently released a new Blaster Master for WiiWare, and Sega has blessed us with Afterburner Climax on Xbox Live Arcade and the Playstation Network. Who said retro gaming should stay in the past? One company that is truly taking this “everything old is new” philosophy to heart is Konami. The publisher recently embraced WiiWare, sharing new renditions of its Gradius, Castlevania, and Contra series, and now yet another classic property is set to return. The best part? This one got his start on the Sega Genesis. 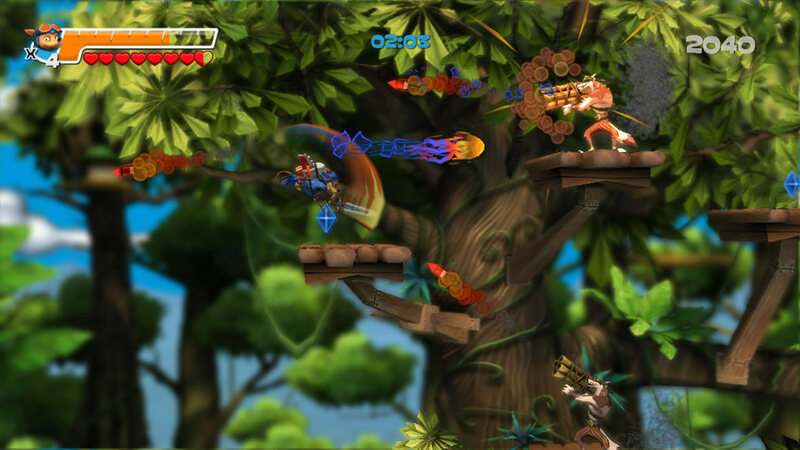 Coming May 12 for Xbox Live Arcade and Steam, and May 18 for the Playstation Network, that possum with a need for speed, Sparkster, makes his triumphant return to gaming. Rocket Knight is a true sequel to the classic Rocket Knight Adventures and Sparkster, and it takes place fifteen years after the last game (which was also released for the SNES). Retaining its 2D gameplay but boasting modern visuals and sound, the series is poised to return to gaming in a big fashion. Zephyrus. An army of wolves has invaded, and only the hero with “blast possuming” can save it. 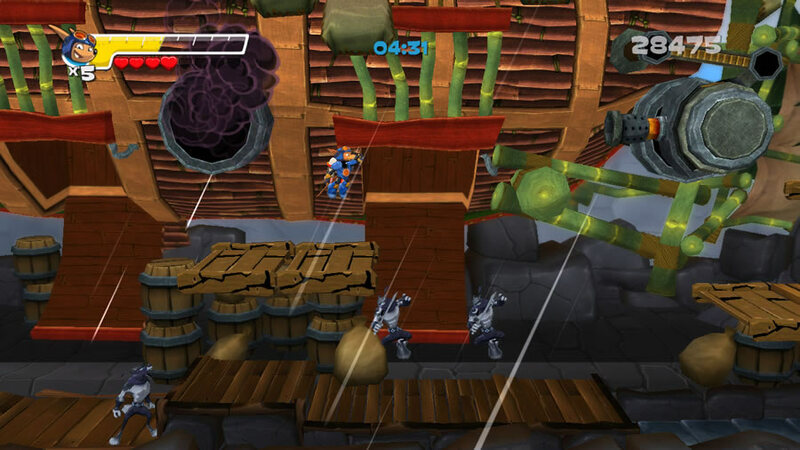 The game is set over four unique worlds, broken into ten stages, that shift between traditional platforming and speedy rocket pack flight levels. The gameplay and visuals come together to create that “2.5D” feel a lot of companies are settling on for updates to classic titles, and while the verdict is still out about how the public will receive the new art style, one can’t deny that the classic Rocket Knight feel is definitely there. Players can expect Sparkster to have all of his famous moves, including his ever-handy prehensile tail. His trademark rocket pack is his most valuable asset, and he can drill through walls with it to make new passageways, hover in place, and ricochet off walls. His weaponry is just as powerful, and the armored marsupial is now ready to create a burst vortex to knock enemy bombs back at them or shoot at enemies from afar while flying. The new Rocket Knight features all the bells and whistles one would expect from a modern game for XBLA and PSN, including achievements/trophies and leaderboards (for scores and timed runs). We have to admit that excitement for this one runs high, and everyone at Sega-16 Central is hoping that this sequel can do the series justice. The original game is a bona fide classic, and Sparkster was a solid and fun platformer. Can this one stand up to its pedigree? We think so. But hey, don’t take our word for it. We went straight to the opossum’s lair and talked with associate producer Tomm Hulett about how the new game came to be and what to expect. Sega-16: How did the decision to revisit Rocket Knight come about? Tomm Hulett: I’ve been a Sparkster fan since Rocket Knight Adventures, so this was a game I pitched as soon as I came to Konami. It took a while before I found the perfect pitch that made sense, but I finally did, so here we are! Konami charged me with the duty of “establishing an identity” for Rocket Knight, and so that was my top priority on this project. Sega-16: Making an older series accessible to new players while maintaining its heritage can be a tricky undertaking. What was your plan for addressing both types of gamers? Tomm Hulett: The interesting thing about the original trilogy of games is they didn’t have one unified “feel.” This was a big difference from working on Contra 4, where we had three games with a very specific, shared feel to model the gameplay after. So rather than picking one of the games as “the correct” Rocket Knight feel, we set out to establish our own. For whatever reason, the series didn’t take off all those years ago – so if we emulated one style perfectly, we’d be repeating all the successes, but also any failures. It was important to emphasize the good aspects of Rocket Knight while trimming anything unnecessary. Sega-16: What elements of the original games did you want to emphasize with this sequel? Tomm Hulett: The number one element I wanted to come across in our game was the rocket pack. It’s the ROCKET Knight series, after all. In the old games, in many cases, using the rocket pack was a dangerous proposition, as it would carry you into offscreen enemies and hazards. In the end, you couldn’t make frequent use of your rocket pack until you had memorized every stage. The rocket pack should be something fun that is central to gameplay, not a dangerous “for experts only” feature. I’m all for difficult challenges the player can only earn by mastering deft use of his rocket pack, but that’s a far cry from forcing the player to “earn the right” to use his rocket pack effectively. The comparison I gave Climax (the developer) was the pogo jump in Ducktales from the NES. It was designed as a cool move for the player to use once in a while, but whenever someone plays Ducktales they pogo jump almost the entire game, because it’s just so much fun. That’s how I wanted Sparkster’s rocket pack to feel. Sega-16: The “2.5D” gameplay choice seems to be the compromise between classic 2D gameplay and 3D visuals that more developers are making when it comes to bringing classic franchises into the modern era. Was this the plan from the beginning, or was it ever under consideration to go full 3D? Tomm Hulett: Rocket Knight has always been intended as a 2D platformer. Going full 3D would be a huge budget commitment, and would also make for a large capacity, expensive downloadable product. Hopefully in the future we can see Sparkster in a solid 3D platformer, but at the moment he’s sticking to his classic roots. Sega-16: Has series producer Nobuya Nakazato had any involvement in development? Tomm Hulett: Nakazato-san hasn’t had any direct involvement with the game. Sega-16: The visual style is something of a departure from the original. Why the change? Tomm Hulett: The visuals are 3D polygons now, rather than 2D sprites, but I don’t think the overall visual style has changed. 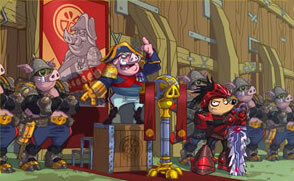 Both approaches highlight Sparkster’s colorful, animated world. We’ve also retained the steampunk aesthetic that made the originals stand out. 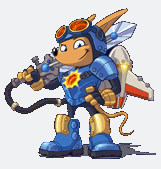 We’ve actually played up the steampunk a bit in Sparkster’s armor design, with big rivets and his updated sword. The decision to go 2.5D with polygons was simply doing the most with what we had. It’s expensive to make sprites, and if we had done that, the game would be very short. It was more important to me to create a fun platformer with depth that felt like “a complete experience” rather than a really short, hand-drawn one. 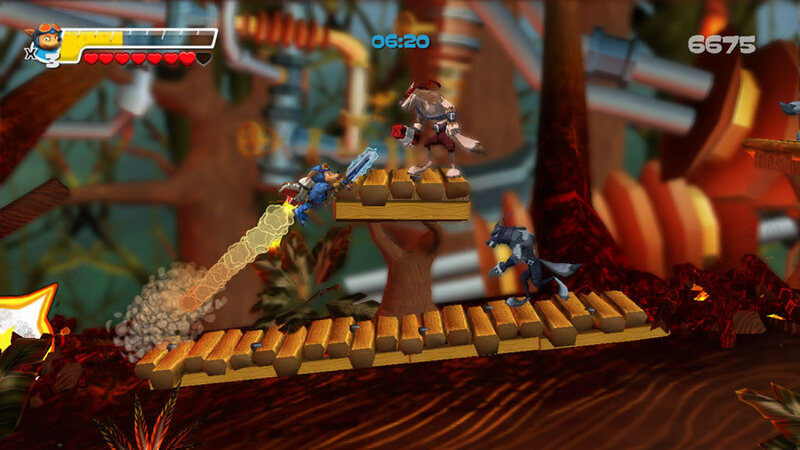 Sega-16: We’ve gone from pigs to wolves! Will the Devotindos Empires be making an appearance? Tomm Hulett: Actually, Sparkster fought the wolves in Sparkster for the SNES, so this isn’t his first foray into fur flaying. As their kingdom was destroyed after the first Rocket Knight Adventures, the Devotindos people (well, pigs) have been granted asylum in Zephyrus and now live in harmony with the possum Zephyrians. This decision is what caused Sparkster to leave his homeland fifteen years ago and the reason you haven’t been playing Rocket Knight titles in that time. But Sparkster is unable to ignore his people when he sees the Wolves attacking, and so he rockets into action and the new game begins. Sega-16: Any chance that we’ll see another revival if this one sells well (Read: Zombies Ate My Neighbors)? Tomm Hulett: I’ve been a huge Konami fan my entire life, so I’m always trying to think of cool ways to revive my favorites. Unfortunately Konami only published ZAMN back in the day, and I believe Lucasarts holds the rights to that. But it never hurts to let Konami know which games you’d like to see again! Any Bayou Billy fans out there? Sega-16 would like to thank Tomm Hulett and Robert Santini of Konami for the interview. We’ll be watching with eager anticipation for this game to drop, and when it does we’ll be here with a full review. Until then, feast on those tasty screen shots.